I think most of us are familiar with BASIC games creator Andre Baune and how he manages a fair turn of speed with his creations well I thought I'd try his Alien Mind a BASIC puzzle game, with the new fast ROM, and the speed increase is fantastic. i'll just put this here while i pick myself up off the floor ! The YouTube has been removed for copyright reasons, unfortunately. I'd appreciate another. When I get some time and a clear workbench I plan to take this baby out for a test drive. I'm thinking in terms of the Multi-ROM adapter discussed here: viewtopic.php?f=20&t=1006&hilit=Multi+ROM Haven't heard from the creator lately though. You still out there sascha2000? Once again, way to go zsolt. An outstanding achievement. Thank you for your feedbacks i am glad if you like it. This Zeddy has a "language" card, which allows to map RAM to 0K-8K to test a new rom (a new "program language") in RAM, before an EPROM is burnt. 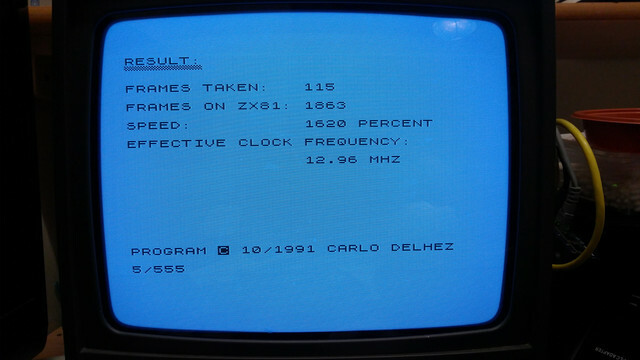 There I tested my own rom patches: the original ZX81X2 rom worked well, but not my patched rom. While I was looking on my PC screen to find the error in the source code of my patches, the screen got black and the light went out (main 16A fuse blown out). I disconnected the Zeddy from mains and was able to switch on the fuse. Last edited by siggi on Sat Sep 29, 2018 12:58 pm, edited 1 time in total.